What a handsome frog Lois. Awesome photo. Lois, this is great too! 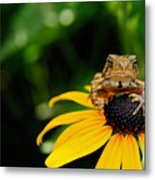 I love frogs - and to find one in his natural environment and on a flower too - that's so unique! Great work! 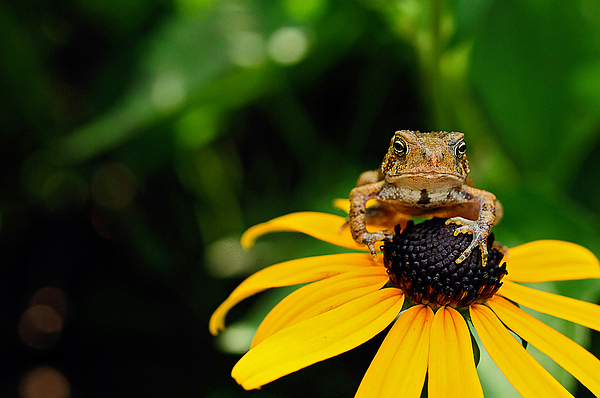 I never thought I would say a frog looked cute, but this one does! This is an amazing capture! Lovely Lois. Featured, voted and faved. laughing ... thank you, jrr ... and for the Feature in "Loving the Color Yellow" too!!!! NOTE: FINE ART AMERICA WATERMARK WILL NOT APPEAR ON PURCHASED IMAGE. Harbinger "A person or thing that announces the approach of another." It won't be long before I'll take the dogs out in the evening and hear the high pitched chirps of my little amphibian friends, calling to each other in the darkness and telling me that spring is near. Surprisingly, as early as February I hear their nocturnal love songs ... they always bring a smile. Image taken with Nikon D300 and 60mm Nikon Macro/Micro lens July, 2009. 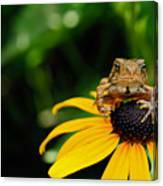 "The Harbinger" won Second Place in the Fine Art America contest "Portrait Frogs" September 28, 2014.